The Focus software is designed to be as intuitive and user friendly as possible. 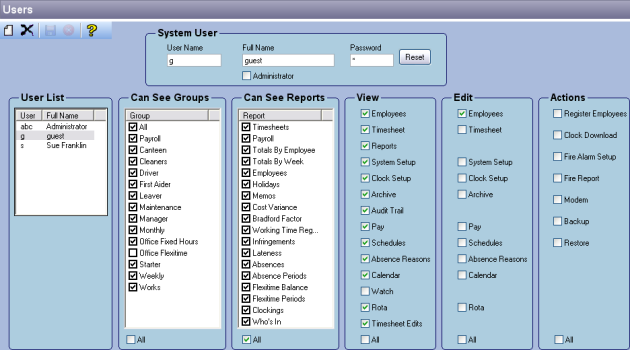 Our interface uses simple icons and drop down menus to allow you to navigate simply through the program using an Outlook approach that many are very familiar with. It is also designed to be compatible with any of your existing systems. Not only can you export information directly to your payroll software package (SAGE, Pegasus etc) but you can also import information too, such as employee records and pay rates. Each of the different reports Focus creates can be produced as a PDF file (.pdf), an Excel Spreadsheet (.xls), an HTML file (.htm), a Rich Text Format (.rtf) file, a Text (.txt) file or a Tagged Image Format File (.tif) to ensure you can get them to whoever needs to see them. 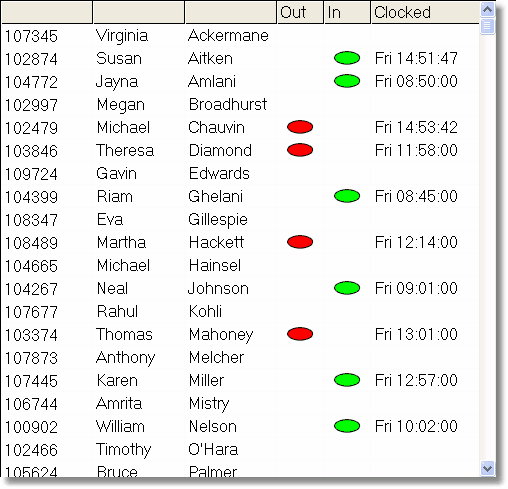 The Timesheet is perhaps the screen you will become most familiar with. It takes the clocking information for each employee throughout each week, and applies whatever rules are in place. 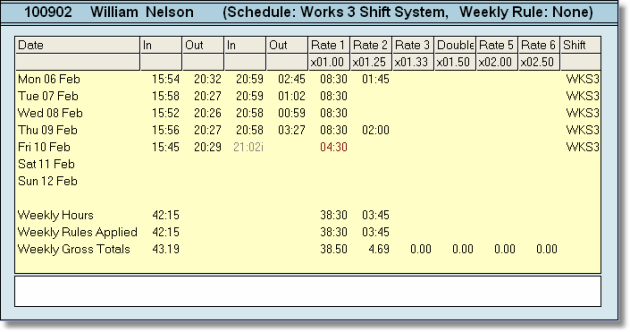 See A Week At A View: The Timesheet expands to accommodate clockings, showing times in and out and also total hours. Fully Editable: The Timesheet isn’t set in stone – you can change any information as necessary. When you do so Focus will record the change, the reason and the person responsible for the change to prevent any misuse. Exceptions: It will record any instances of not clocking in or out, or any failure to reach target hours. Daily Rules: The Timesheet will tell you which of your Daily Rules (eg Night Shift, Admin etc) is being applied to the employee. The Watch Function is a real-time display of employees clocked in or out. There is no need to manually download the clock or refresh the screen, it will change with each clock in so that you always know who is in or out of the building. You can set up the Watch Screen to watch specific groups or sections. Reception/Switchboard: You may wish to provide the reception or switchboard area with a Watch screen, to allow them to have a current, real-time view of who is in and out of the building for dealing with visitors or phone calls. 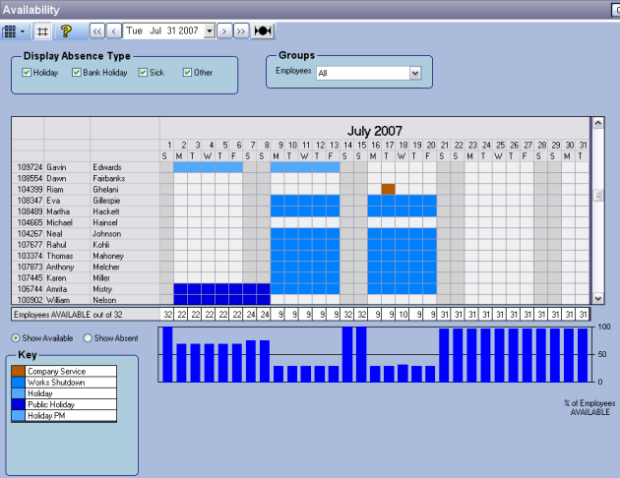 Supervisors: Supervisors can be set up to see only their specific group of employees and monitor their attendance. In either case, you can allow access to the Watch screen but prevent access to any other features or information within the software, using our User Access options. The Calendar allows you to see a year at a glance for each employee. It will show you all instances of planned or unplanned absences, holidays, paid and unpaid sick leave and any other event you wish the system to monitor. Holiday Allowance: You may start the holiday year at any date you wish, setting a different date for each employee if required. The Calendar will tell you clearly how many holiday days have been accrued, how many taken and how many have been booked. Book Absences: you may book any planned absences, such as holidays or training courses. You can do this for individuals or groups. 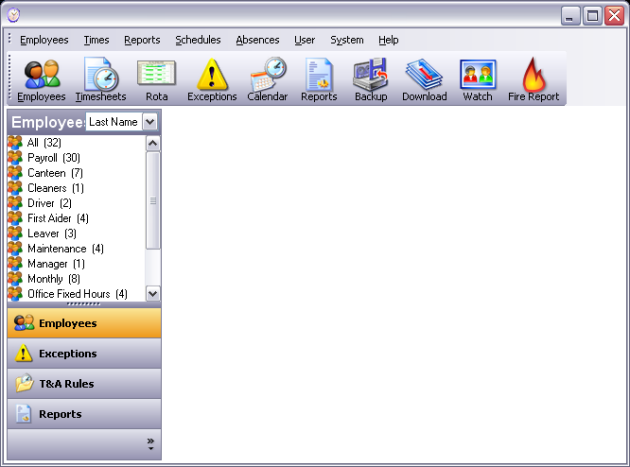 View Absences: you can analyse the calendar based on different absence types, over different date ranges. 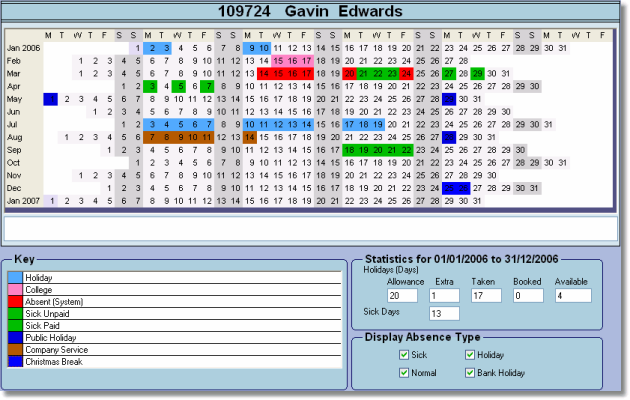 The Availability Screen shows all planned and unplanned absences of your staff. You can view all employees or only individual groups. You may also book holidays and time off directly from this screen. It gives you an instant overview of how many of your workforce are expected to be in work at any given time. Attendance figures are then represented as a percentage. This is an invaluable tool for booking time off, as you can immediately see just how understaffed you may be over the time requested. It also allows you to plan in advance to cover things such as training courses or external meetings. Using our Scheduling and Roster tools you can set up fixed or flexible working patterns for your employees and implement them according to the needs of your business. Daily Rules: You can set up rules concerning rounding up or down clockings, applying breaks or overtime rates. You can have as many different rules as you wish. Work Schedules: You can define exactly how Daily Rules combine for fixed shifts, cutting down immeasurably on administration time. Weekly Overtime Rules: This allows you to manage ‘Clawback’ and ‘Rollover’ over the weeks. Rotating Shifts: You can set up rules that repeat over as many or as few days as you require. Absent Days and Target Hours; You will be informed of all absences and any failure to meet target hours. Reception/Switchboard: A Reception/Switchboard computer can be set up to see the Watch page only – knowing at a glance who is in and out of the building for incoming calls/visits. Departmental Reports: Department heads can be given access to only their own group’s reports so that they can better manage and action any issues. Supervisor Access: Supervisors can have access to their own areas so that they may be empowered to oversee the clock ins and make any adjustments as necessary. Focus can also produce a multitude of reports to allow you to interpret the collected data in many different way. Reports can be exported as any of seven file types, including PDF and Excel documents. Please click on the links below to see some sample reports. Focus has Scripting options allowing the user to create his or her own scripts within the program, to give you complete flexibility.